Baltimore is without a doubt a city on the rise. The downtown area has become a popular national and even international tourist destination, and a great deal of development is going on in the surrounding areas of the harbor. Academic institutions such as Johns Hopkins and University of Maryland are pouring millions into the development of their city campuses and hospitals, and this in turn is creating jobs and attracting professionals to the area. But Baltimore also garners its share of negative attention. Despite the declining crime rate and a murder rate that has exponentially decreased, the city still is not without problems. The city’s police department handles most of the law enforcement in the area, but when these problems are too great or complex, the federal law enforcement agencies step in. These agencies, such as the FBI and the ATF investigate large scale criminal operations in the area and have also taken a more active role in busting up criminal gangs through conspiracy and racketeering charges. An example of one of these operations just landed Baltimore in the national news after upwards of 30 inmates and 10 corrections officers at the city detention center were indicted for numerous federal crimes. The local cops definitely helped with the investigation, but when it came down to it, the U.S. agents and prosecutors were the ones calling the ball. 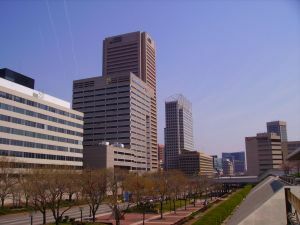 The United States District Court has two locations in Maryland, and both of these courts handle criminal cases. If you or a loved one has been charged or is being investigated for a federal crime the case will either be held in Baltimore or Greenbelt. Either way, it goes without saying that the stakes are extremely high in these types of cases. The United States Attorneys and various federal law enforcement agencies often conduct lengthy investigations before they make arrests. As a result, the government’s evidence is typically more substantial and witnesses are better-prepared and more likely to show up than in city or county cases. In the Baltimore City courthouses dozens of cases are dismissed each day simply because the state’s witnesses fail to show up, or the prosecution is unprepared for trial. The city circuit court docket moves slowly and there is a great deal of negotiation going on while court is in session. A large percentage of plea deals occur on the day of trial, and some during trial. But a couple blocks away at the federal courthouse the story is entirely different, and for this reason it is absolutely essential to retain a sharp and aggressive federal defense attorney to defend you or a loved one. Many federal criminal cases involve co-defendants, whereas the majority of city and county cases have only defendant. In co-defendant cases the charges will typically include a criminal act such as distribution of drugs or robbery, and additional charges for conspiracy to commit these offenses. The city and county prosecutors rarely use conspiracy charges but they are commonplace in the federal system because so many co-defendants end up turning to testify for the government. Turning witnesses is one of the most powerful tools for U.S. attorneys and agents, and a lawyer must be well versed in how to handle this government tactic. The feds also uses racketeering charges under the RICO laws to prosecute groups of people involved in organized crime and gangs. Once again, these situations are unique and challenging, and the lawyers at The Herbst Firm are up to the challenge. Contact our office for a free consultation at anytime, day or night and let us start fighting for you.